The leading cause of fatal and critical injury BASE accidents is object strike. Object strike is most likely to occur during an off heading opening from a solid, slider down object. This four day course offers training in the critical safety skills for jumping solid (generally cliffs and buildings), slider down (lower than 600’) objects. 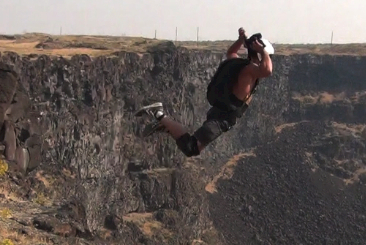 This is excellent preparation for many legal cliff jumps in the Western USA. Unpacked jumps: As appropriate to conditions, Rollover, TARD and TARD over. DBS customization: Repeated unpacked jumps, adjusting the DBS between loads. Student performs brakes-set flight and riser turn drill to evaluate brakes and stall point. This usually takes around 5 jumps. Installation and bar tacking of custom DBS (as a third setting on the control line). Cliff jumps: Cliff jumps from legal cliff exit points with running exits. Topics are frequently presented in other orders, especially when responding to weather conditions to take advantage of jumping windows.